David and I are huge lovers of pasta, and since I don't cook meat, we do eat pasta rather frequently. With the start of the new year, I've been trying to cook healthier and lighter foods in an attempt to get my diet back on track. I'm not giving up pasta altogether (that would be crazy!) but I am trying to cook less of it and more of the vegetables we enjoy. A great way to get our pasta fix without all the calories, carbs, and guilt is spaghetti squash. After roasting, the flesh of this squash is scraped away from the skin and it separates into strands that resemble spaghetti, hence the name spaghetti squash. It can be used just like spaghetti and topped with anything you can dream up. 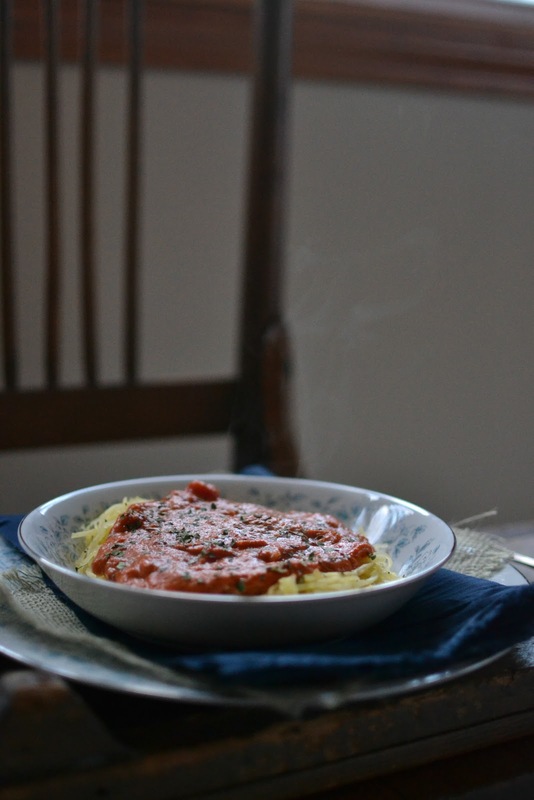 For dinner one night last week, I made spaghetti squash with creamy marinara and it was a big hit! It even reheated well for lunch the next day, which is perfect because we had plenty of leftovers. Cook the spaghetti squash and remove the flesh using a fork (great tutorial here). While the squash is cooking, heat the marinara in a saucepan. Stir in the goat cheese and warm through until melted and incorporated into the marinara sauce (cream cheese or this dairy-free cream cheese also work well). 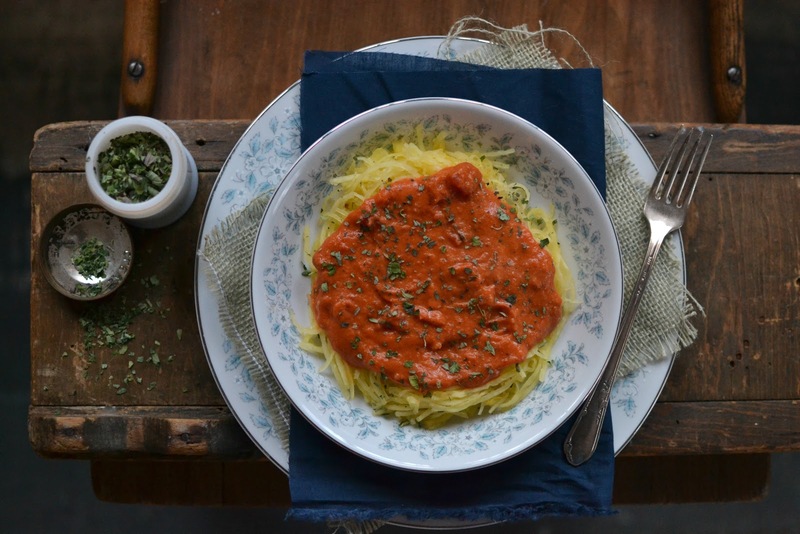 Place the spaghetti squash onto a pretty plate and top with lots of the creamy marinara. Add dried oregano to taste and enjoy while warm. I often make this creamy marinara when I have a small knob of goat cheese leftover after using some in a previous dish, so the amount isn't too specific. Of course the spaghetti squash would be good with just the marinara sauce, but I've found adding in a bit of cheese just takes it over the top and turns a good dish into a great one. Nothing beats the depth of flavor and creaminess that a little goat cheese adds to the marinara. Have you ever tried spaghetti squash? I adore spaghetti squash. I even crave it sometimes. I toss mine w/ butter, garlic, and parmesan. Delicious! I really like spaghetti squash. We have it with pasta sauce as you show in your post and also with a really good herbed, Parmesan garlic butter. Quite yummy. I think I may have it with supper tonight! i haven't tried it but have heard great things about it...i guess i should give it a whirl! As to the sauce, as everyone knows, sauces don't grow on trees. I have to admit I've tried planting cans & tins of food; but how ever much I may water and give them plant-food, they never seem to grow into trees or shrubs with cans for fruit. That was just wishful thinking. I keep intending to try spaghetti squash, this recipe may just be the prod I needed! Since I am an unabashed pasta lover, I must try this. I love spagetti squash. Thanks for the great new recipie. I haven't but have been wanting to and this looks like just what I need to try it. Perfect cold day dinner. Thanks Tammy. Spaghetti squash is one of those things I keep telling myself to try and keep putting it off. I bet the goat cheese makes it divine! And soon it will be served with your own goat cheese! :) I love all squash, this one included and I could never give up pasta either - no way! I REALLY need to try this - I always forget to add this into my weekly menu rotation but it's a no brainer and so much better than my favorite carb trap! Your pictures are amazing too! Thanks for sharing!!! Have you tried the protein based pasta by Barilla? I use it on occasion here. It's a great alternative for those on a grain-free diet. Yours sounds yummy with the addition of the goat cheese. Enjoy the leftovers! Everytime I see a recipe with Spaghetti Squash I remember how much I want to try it. For some reason, I can never remember to buy it! Your photo's are absolutely stunning! Love the addition of goat cheese to marinara sauce, beautiful pics! We grow spaghetti squash! I love it with homegrown pesto too. Mmm. I've never used spaghetti squash, but I should. I love pasta but I'm not supposed to eat much of it so that would be a great substitute! Tammy, It looks delicious. I love veggies and would enjoy this dish not so sure about my hubby and son.. I do love pasta and spaghetti and could never stop eating it. Thanks for sharing your recipe. Have a happy day! I like the birdseye view of the dish, very nice. I've heard of spaghetti squash, but did not know it was actual squash. I enjoy eating the yellow crooked neck squash, so I might like it as spaghetti. I 'll have to try! I really want to try squash pasta. It is on my to do list. Yes, we eat spaghetti squash too. And we all love it. Love your photos, they are so creative. Looks delish. We are a huge fan of spaghetti squash. It is so refreshing. No I haven't tried spaghetti squash but would absolutely love to! This looks so delicious. Oh, your spaghetti squash looks so delicious, I love spaghetti squash! I am such a fan of spaghetti squash! Love your recipe. I had to click on this post immediately I saw the pic of the spaghetti hah! I had plans to make spaghetti but I wanted a new recipe, and this will do just fine. Thank you,will try it. I'm trying to cut back on the amount of grains we eat too. Definitely going to try this (pinned it for reference). Thanks for sharing.